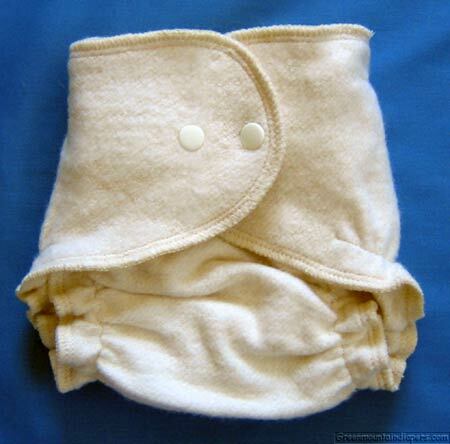 Organic cloth diapers of the purest kind. Even the thread is cotton, unlike the Workhorse diapers. These are a step above the less expensive fitteds. 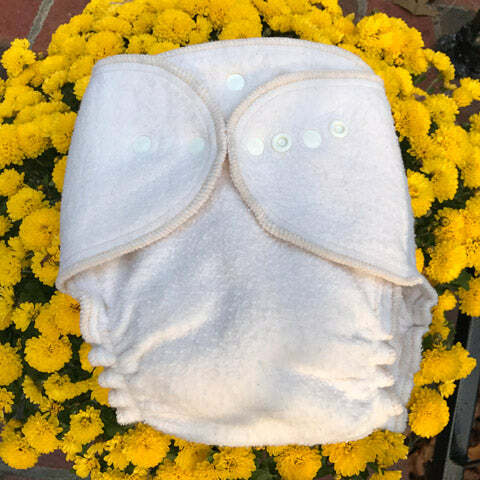 One-size organic cotton fitted cloth diapers made in the USA. By Babee Greens. USA organicially cotton, USA made! Cotton edge thread! A rare find. 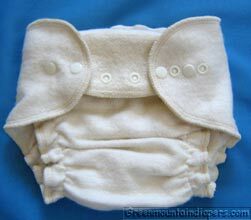 Almost everything these days has polyester or nylon threads, but not these lovely natural fitted diapers. This makes a great nighttime diaper because it has enough room inside it to fit plenty of doublers. It has a lot more room inside for adding extra absorbency than the Workhorse does. It is a true fitted with the elastic curved around the leg (not sewn straight like Workhorse). This curved elastic sewing is really nice for containment. High quality sewing and design made in North Carolina from organically grown USA cotton. It is important, especially while baby is young, to choose a roomy enough cover to fit over this diaper. 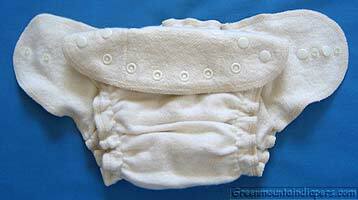 One-size diapers are bigger than sized diapers on young babies so they are a good choice. Choose roomy cover styles over this diaper. 12 pounds, 3 months old. 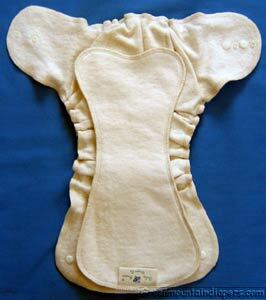 The organic cotton is so soft and the elastics are very gentle. A little story about Growing Greens, October 13-14, 2006: Mothering Magazine and the Real Diaper Association sponsored a booth at the Green Festival in Washington DC, and invited me (Karen) to teach moms about cloth diapering in their Mom's breakroom/nursingroom/changing area. 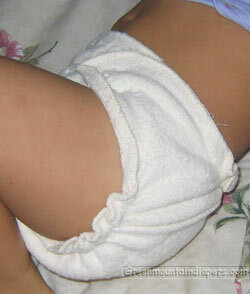 I cloth diapered a whole bunch of babies I had never seen before, from age 3 weeks to over 2 years. This was my absolute favorite diaper to put on those babies because it fit every baby! Using most other diapers, I had to guess which size and then sometimes try again. Not fun when you are shy and nervous about diapering someone else's baby. But every time I used a Growing Green, I got a perfect fit and lots of "wows" and "oohs and ahhs" from the parents, many of whom were trying cloth for the very first time. My 11 year old daughter, the ace Snappi-Fastening-a-prefold demonstrator, and I had such fun teaching cloth diapering that weekend! See pictures on the inside back cover of Mothering Magazine Jan/Feb 2007 issue. This is the largest setting on a 28 month old 30 pound toddler. A 2 year old is a lot taller than a 12 month old. It does still fit this 2 year old, but it's starting to get short in the rise on her. 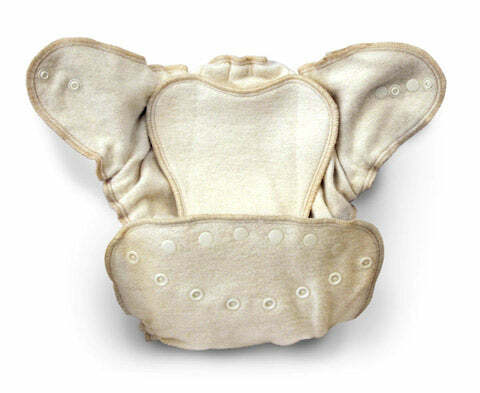 One-size diapers are handy when you have 2 babies of different ages or sizes both in diapers. If this diaper, or any one-size diaper, had been purchased at birth and used for 28 months straight, it would be quite worn out at this point. This picture is of a diaper that has been in use for 1 month. Does one-size make sense for you? Click here. They can work on newborns! 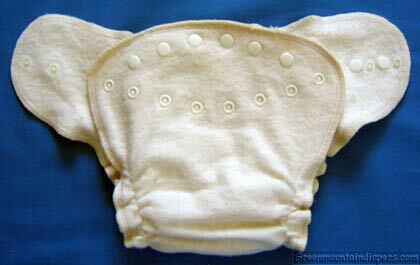 But keep in mind anything that will fit a 20 month old will be a bit big on a newborn, but it is workable. The trick is to be SURE to choose a full-cut cover to put over it. The same goes for Snug to Fit one-size diapers when using them on newborns. For example, some favorites are Disana Organic Wool pull-on, Lana Merino Wool, Disana Sleep Sack, Lana Softsleeper or Bummis The Pull-On. 10 days old, 7.5 pounds. Choose full cut covers over this at this age! Wrap styles will work with this when baby is older, but not at this smallest setting. same as above. This is the OCGG (organic cotton version). It does fit in the skinny newborn legs and contain well. A very nice diaper! Organically grown 100% cotton version, called "OCGG" for "Organic Cotton Growing Greens" are all cotton. 100% Cotton is easy to wash, though, so that is a nice advantage over the hemp/cotton version we used to carry. This is a very high quality, durable cotton. 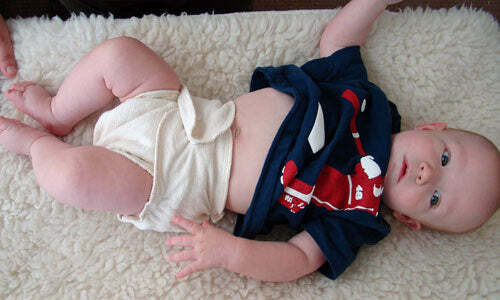 100%-cotton diapers are easiest because they wash well. 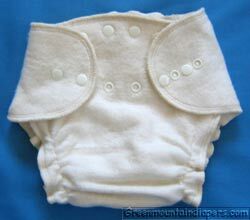 They don't hold any stink like the many "sherpa" diapers out there that are really 10% polyester. I love cotton! 10 months old, 20 pounds. The height is folded down to the medium setting. 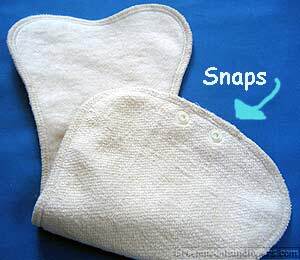 A snap in doubler is included with each diaper. Snap it in for older baby. You can use just the doubler for a newborn. Growing Greens diapers are really much nicer than they look in the pictures. I don't know why they don't photograph well, but in real life, this is a diaper to reach for first. Does one-size make sense for you? Click here. Have realistic expectations. I love this diaper because it really fits just about all babies. No worries about chubby or thin, it fits both shapes. It's very absorbent, too. Plus, it has no polyester content.